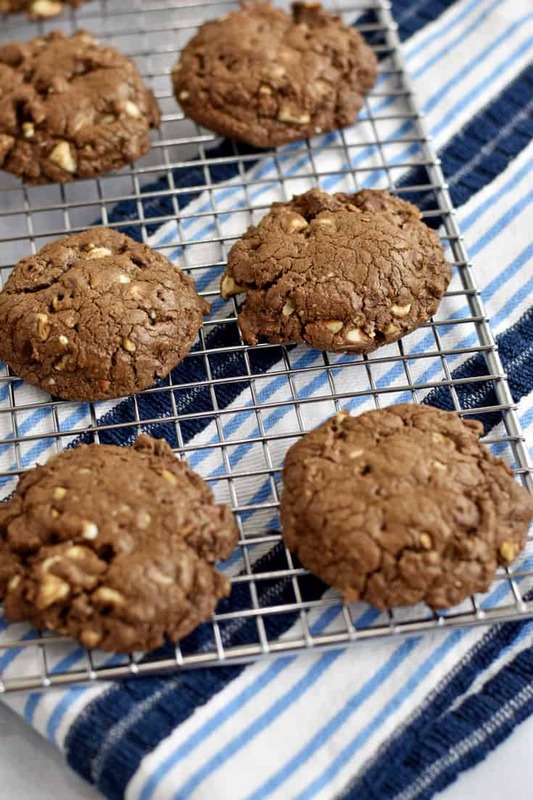 These chocolate chip pecan cookies are soft, chewy, and packed with flavor. 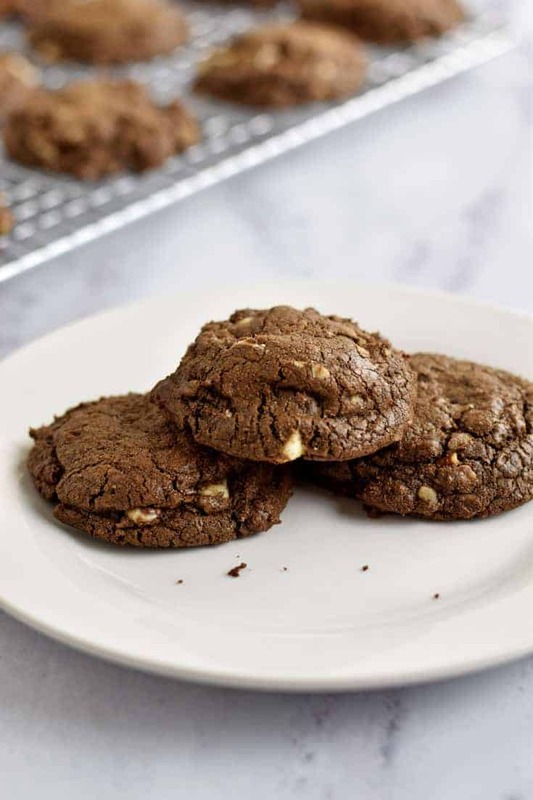 The combination of semi-sweet chocolate, white chocolate, and pecans makes these Double Chocolate Pecan Chip Cookies a must-bake! One thing I love to do when making cookies is change up the ingredients. 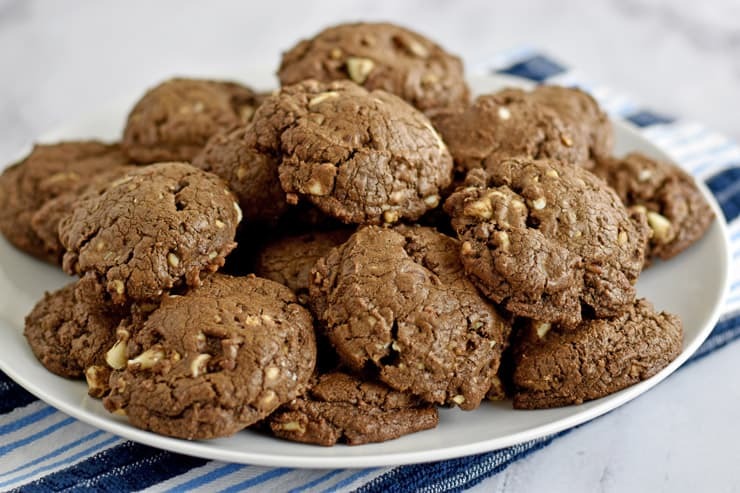 A basic chocolate chip cookie is hard to beat, but try a couple different chip flavors, throw in some nuts, and you might have a new favorite cookie recipe. If you’re not a fan of nuts or chocolate, you’ll want to try these Lemon Cookies with Lemon Glaze or Toasted Coconut Butterscotch Oatmeal Cookies. Both recipes are easy to make and completely free of nuts and chocolate. When it comes to chocolate, I usually prefer dark, but this time I used a combination of white and semi-sweet chips. I also threw in some pecan chips to add a little crunch. Preheat the oven to 350 degrees. Line baking sheets with silicone liners or parchment paper. In a small mixing bowl, combine the flour, unsweetened cocoa, baking soda, and salt. Whisk together until combined (photos 1 & 2). Using an electric mixer, beat the butter, sugars, and vanilla in a large mixing bowl until creamy (photos 3 & 4). Add eggs, one at a time, to the butter and sugar mixture, and stir until combined (photo 5). Gradually add the flour mixture to the sugar mixture and stir until combined (photo 6). Stir white chocolate, semi-sweet chocolate, and pecan chips into the cookie dough (photo 7). Drop the dough by 2-tablespoon portions, 2 inches apart, on the prepared pans (photo 8). Bake 9 to 11 minutes, or until the cookies are set (photo 9). Allow cookies to cool on the pan for 5 minutes. Then transfer to a wire rack to cool completely. Check your gluten free flour mix for xanthan gum. If the mix doesn’t contain xanthan gum, try adding 1/2 teaspoon to the recipe. I used Bob’s Red Mill Gluten Free 1 to 1 Baking Flour which has xanthan gum in it. Use a 2-tablespoon scoop to drop the dough on the prepared pans. The scoop allows you to use the same amount of dough for each cookie. When the cookie dough balls are equal in size, they bake more evenly. Since the cookie dough is dark, you won’t be able to tell if the cookies are done based on their color. Instead you want to bake the cookies until they are “set”. The edges of the cookies will be slightly firm and the tops should look dry. The cookies can be stored in an airtight container for up to 1 week. They can also be frozen, in a freezer safe container, for up to 2 months. 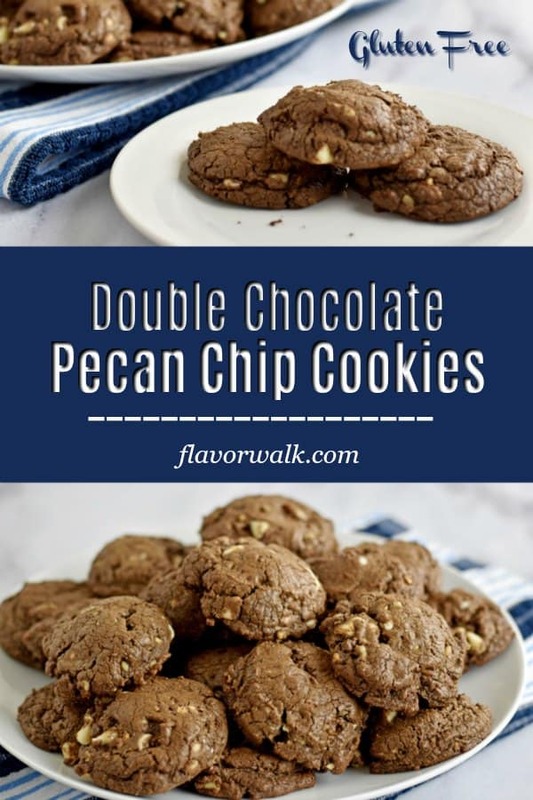 If you have a chocolate craving, give these Double Chocolate Pecan Chip Cookies a try. I hope you enjoy them as much as we do. Happy Baking! If you tried this recipe or any other recipe on the blog, don’t forget to leave a star rating and let me know how it turned out in the comments below. I really enjoy hearing from you! You can also FOLLOW ME on Facebook, Instagram and Pinterest to see more of the delicious food I’m making! Preheat oven to 350 degrees. Line baking sheets with silicone liners or parchment paper. In a small mixing bowl, add the flour, unsweetened cocoa, baking soda, and salt. Whisk together until combined. Using an electric mixer, beat the butter, sugars, and vanilla in a large mixing bowl until creamy. Add eggs, one at a time, to the butter and sugar mixture, and stir until combined. Gradually add the flour mixture to the sugar mixture and stir until incorporated..
Add in the white chocolate, semi-sweet chocolate, and pecan chips and stir until combined. Drop the dough by 2-tablespoon portions, 2 inches apart, on the prepared pans. Bake 9 to 11 minutes, or until the cookies are set. Allow cookies to cool on pan for 5 minutes, before transferring to a wire rack to cool completely. Recipe slightly adapted from Nestle. 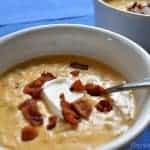 This recipe was first published in 2017, but was published again in 2019 to include updated images, step by step instructions, and nutritional information. 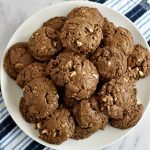 I baked these and took them to my exercise group and they thought they were very good .thanks for sharing this delicious recipe . Thanks for taking the time to leave a comment. I’m happy to hear the group enjoyed the cookies.